Lisa worked within the specifications of the custom woodwork to create this fireplace surround. It was challenging as the reduction of tile size during firing had to be calculated and the design made to fit within the parameters. The end result combines the classicism reminiscent of Delft tile, with the casual elegance befitting this custom built Vineyard home. 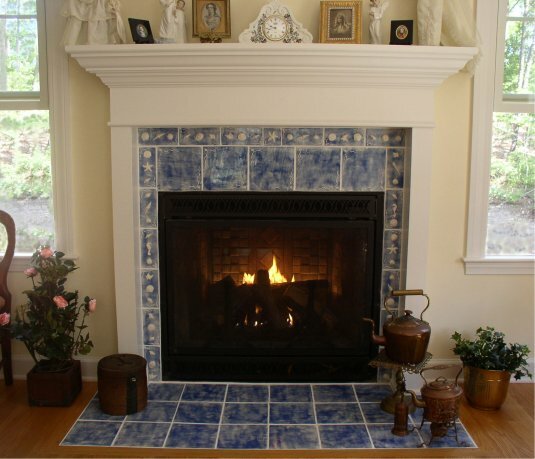 Here are some examples of Lisa Strachan’s custom tile work. She has completed over three dozen installations in kitchens, living rooms and baths from Maine to California, and was honored to be selected as a featured artist in the lovely book Martha’s Vineyard Tile, Hidden Gems in Island Homes published by Vineyard Stories and widely available. Lisa Strachan’s tile work is also included in the Sourcebook of Architectural & Design Elements which can be viewed online at capeandislandsourcebook.com. Prices vary due to size and complexity. However, to give a general idea 3"x6” tiles are $35 each.